Lace-lovin' Librarian: Denise noticed, too! My friend Denise called yesterday to check up on me. She was concerned because I hadn't posted since last Thursday. Denise and my mom are the only people I know for sure check my blog every day. I guess I'd better keep posting so the two of them don't worry about me! I really felt the need to tat with cotton today. Working with metallic threads really slows me down, and I wanted to complete something today. It felt so good to tat with cotton, I actually tatted two Ice Drops today! I had the urge to tat with school colors. I think they turned out nice. Well, I've done my due diligence and blogged for the day, but you won't be seeing a post from me until Monday. My sister and I are flying down to visit Mom and celebrate Janet's 65th birthday, which is coming up soon. It will be the first time for just the three of us to spend a weekend together. Happy birthday, Janet! Good to see you and the latest icedrops! Do stitches in cotton slip along more easily than metallic ones? Have a fabulous weekend. Yes, the stitches do slip along more easily with cotton. I do like the shimmer of the metallics, though! Que hermosa gota de hielo!! I noticed your 'absence', too, as I do try to check every day. 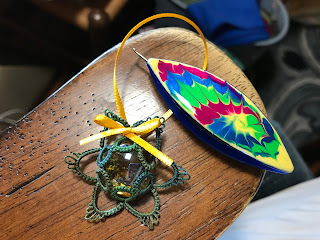 I continue to be impressed by your dedication to tatting, plus so many other crafts! By the way, I looked up how to care for chickens, and now realize how much work is involved. They actually have people who 'babysit' the larger coops occasionally to give the owners a break! There are some amusing youtubes showing how hens choose where to lay their eggs, and farmers use golf balls and fake eggs to 'encourage' them! 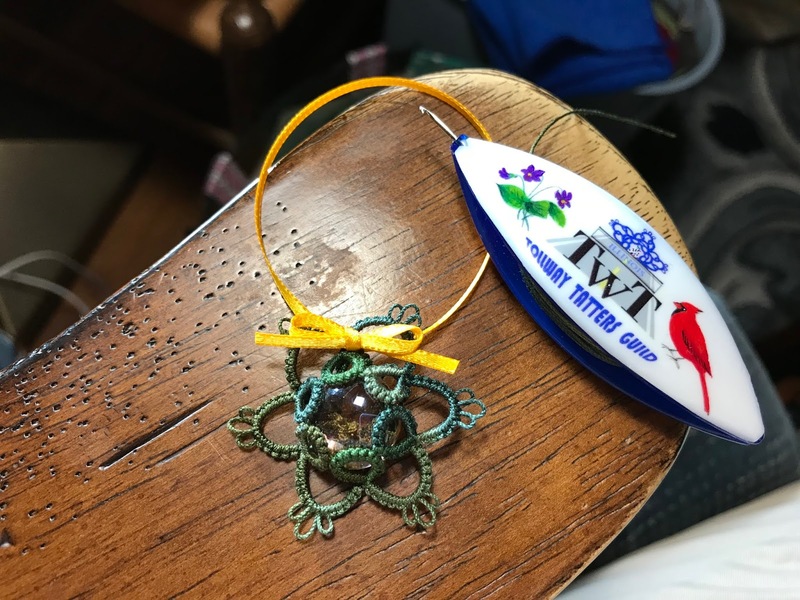 I just received two metallic Lizbeth balls - silver and antique gold - and I look forward to tatting with them. How delightful that you will be together for the special occasion. Have a great trip!